Dreamspace Gallery is pleased to be showcasing Decapage, an exciting new exhibition by three contemporary artists. Demeter Haralabaki, Vivien Lodge and Penelope MacEwen bring a rich exhibition of works using painting, printmaking or collage as tools to explore a world of abstract and figurative metaphor. All members of The Free Painters and Sculptors Society, the trio have previously exhibited together at prestigious galleries such as the Bankside Gallery and Foyles Gallery. As a result it emerged how well their works complemented each other, inspiring the artists to collaborate in this forthcoming exhibition  Decapage. 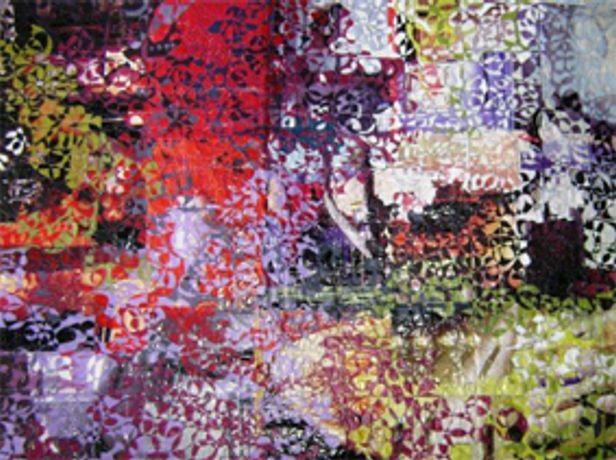 Haralabaki presents work that skilfully combines her training as a textiles artist with her knowledge of painting. The works challenge the cursory glance of the spectator with revelations reaching through layers of intensely coloured material and paint. By contrast, MacEwen's painting reverberates with the themes of darkness and despair juxtaposed against the joy of rebirth and the quest for meaning. Through the use of organic objects such as rope and recycled newspaper MacEwen creates ravaged depictions of often overlooked everyday events. Lodge's work has its foundation in her eye for the particular. She considers common place items and exploits their detail in her painstakingly layered prints, creating visually captivating pieces of monochrome or scintillating colour. The show is a feast of colour and texture that combines unlikely materials with traditional methods and the varied techniques of the artists involved. Decapage will be showing at Dreamspace Gallery, 1  3 Dufferin St, EC1Y 8NA between 16th February and 18th February. Entrance to the gallery is free.